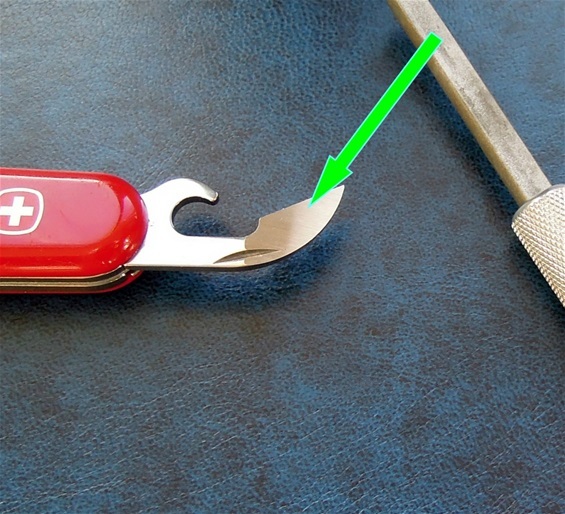 If you are a frequent user of the Victorinox can opener for opening canned food or use the flat screwdriver tip on Phillips heads then it can be smart to know a few things. The edge for the can opener is only a bit sharp because it shall cut metal. It is not necessary to make it very sharp because this can affect the durability. Follow the edge from the factory if you need to sharpen it. It is a very durable can opener so you must open many a box before sharpening it. When you use the tip for Phillips head screws you can get some small damages on the edge and make it a bit dull. To sharpen the can opener you can use narrow diamond coated devices because it follows the curve of the design easy while a wider stone would not. For sure you can use the narrow side on wider stones as well. The best control is with a device such as the pictured one. There are several functions on SAKs that can be sharpened in time. In general serrated and wavy edges stay sharper for a longer time. Serrated scissors are self-sharpening. 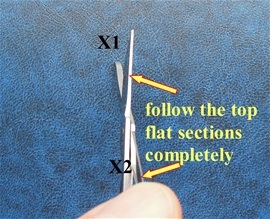 The plain edge Victorinox scissors are very durable. In time you can sharpen them with good result. In time it can be nice to sharpen the plain edge scissors. They are very durable but even so and depending on use it can be valuable to know how. On the picture you can see the perfect size diamond fine stone for it. First you expose the complete flat edge section by holding them apart. In the hand I hold the one side of the handle with the finger. Then with very light pressure I sharpen the flat complete sections. There are two sections on scissors. Again it is only necessary with using light pressure and let the diamond surface to the job. Follow the flat section. Next is the burr that will develop on the inside of the two cut sections. If you have used too much pressure it will be much burr. The result of this is that the functionality of the scissors will not be able to remove this burr when you use it. So once again I recommend looking on what is going on with the edge. 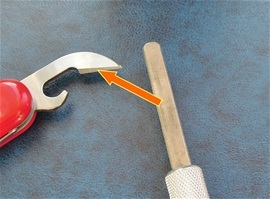 If you have used little pressure then the little burr will be removed by the scissor parts when you use it. If you get second hand SAKs with damaged scissors then it still can be repaired easy. Use diamond coated stones on the flat sections and remove eventually burr if you have to sharpen much. When you remove the burr only use the diamond coated stones with very light pressure just sliding it over the sides. I have seen some scissors that must have been used for cutting wire because it got many damages. Even so I managed to bring back the functionality. 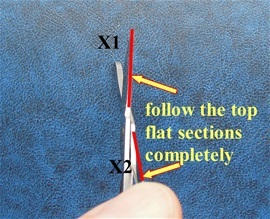 I am just making sure that it is clear that the flat sections on the scissors are the ones to be sharpened. If you remove burr on the inside after this then only use very light pressure. The awl edge can also be sharpened in the same fashion with the flat side to be sharpened. I would also like to mention a few other facts on the scissors. One is that the functionality is best with some oil on the pivot rivet. There is also a small spring system for this functionality and make sure the groove for this and the spring meet. To be sure that the functionality is 100% on the scissors then you use the thumb and press it closed and release the pressure completely by letting the thumb bounce or slide of. The scissors will then go outside the natural gap by a few millimeters outside this spring. If the scissor has been sharpened wrong and there is much burr on the inside then it will not move freely. It can also be that because it has cut wrong materials it could have damages on the edges causing them to get stuck. In some cases they are full of substances and dirt that makes the functionality less. Like you know there are several types of can openers used in the history of SAKs. If you are looking on the modern types then you see that the Victorinox type is double edged while the Wenger type used before the merging is very different. Both types are excellent tools and they do the tasks well. The Wenger type on the picture is the modern type with long configuration. It is not so different from the short one in design. 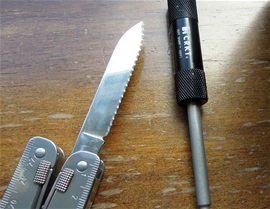 They are durable can openers and in time it can be nice to sharpen it or if you get a second-hand one restore it. Usually it is never necessary to sharpen them very much. What you need to know is that it got two sides that are grinded from the factory. If you look on the two pictures today this is clear to see. The best is to sharpen the narrow flat side on the first picture to the right. After this there can be some burr on the side on the bottom picture. To continue to have the best performance it can be smart to slide the diamond stone across this entire area and remove burr. Always use light pressure. If you only need to sharpen the can opener very little then the amount of burr will be minimum. This will disappear when you use it just like the scissors does. In this case it is the metal from the can that will remove it. The best is to remove it before because it is not fun with stainless steel in the food you are eating. Remember that when you sharpen any function that in many cases this can be seen. It is possible to follow the direction of the grind lines if you are extra carefully. My philosophy is always if SAKs are second-hand or used hard to clean them and sharpen the functions that can. Next is some oil on the friction parts. It is always the use functionality that is important with SAKs. It is pointless to try and hide damages on them. We will see it momentarily. The advantage with SAKs is that you can take abused knives and do a restoration that is simple but effective. Handle scales can be replaced and you can get much use out of the SAK. It is fully possible to re-profile edges and blades. On the picture you can see two very valuable sharpening devices that can be used for the standard SwissTool wavy edge blade and chisel with wire sections. The dimensions on the wire cut parts are a bit so that the best for this is to use the round tapered sharpening device. It will fit most things. When you sharpen the chisel-tip then you only sharpen the flat tip section and remove eventually burr on the side. I have restored SwissTools before with good result. It is always a good thing to have a selection of sharpening devices. In my experience I learned that it will come to use sooner or later always. The biggest section on the small rod on the Veff sharp fit perfect for the waves on the SwissTool wavy blade. I know i have spoken much about sharpening lately. I find it a bit important because from what I have seen on used knives over the years it seems it is usually forgotten. Today people are less interested in taking care of tools and to maintain them. It is not correct because it is important to use tools correct and to maintain them so they can be used time and time again. In my opinion diamond coated stones got many advantages. There is absolutely nothing wrong with natural stones either. The diamond stones will get worn in time and then they can be used for polishing and the surface remains very flat all the time while some natural stones will get a curve that must be straightened in time if not this could cause a very wrong edge on knives. From experience it seems fine and very hard surface without any flex in the materials give the best results. Leather stropping can only be used on SAKs if it is glued to a hard surface. Traditional leather stropping is best on more robust edges or harder steel. On traditional SAKs you can micro convex the edge to make it a bit more durable. From experience it is best with flat edges and to touch them up frequently. If you use a leather strop glued on wood you will many times because the leather got a very small amount of flex depending on the leather and thickness become slightly convex or micro convex. All this depends on the amount of pressure used and to remember that delicate edges can roll or get damages if not this is done correct. It takes practice to use leather stropping on SAKs. From experience I learned that if you glue leather on a hard surface and only slide the edge over the leather you will polish the edge and get a micro convex on it. If I could call it so. The advantage with SAKs precision blades and steel is that it is very easy to sharpen and it bites into many materials. You can reach places other blades just can forget about. When you sharpen traditional SAKs with a flat edge 30-40 degrees and polish them with extra fine stones then you can get them very sharp. The most durable edges got a micro convex to them. Many forget that in many cases you will somehow get that micro convex because it is difficult without practice to get it flat completely. If you use a diamond coated stone like I explained with some width then you reduce this issue. Some would say that if you use narrow stones and slide along the complete edge you will also reduce it. From experience sharpening 91mm blades for example a bit wider stone will because of a large contact area be better and that it is important that when you sharpen blades it is not enough to slide it along the edge only. The best is to use all directions. Slide along, cross motion and circular motions are the key. It is nothing new with sharpening devices or pocket tools for maintenance on edges. On this picture you can see a leather Valet strop. This can be used on SAKs blades when you put the leather on a table or hard surface. It is very thin and it will prevent the flexibility that could cause micro-convex edges. As said it is demanding to use this without practice and all my experience suggest the best is to hold the SAK firm in one hand and use diamond coated stones and the movement with the main hand. If you use thin leather it is best for polishing the edge and use very light pressure. The Valet strop is mainly for vintage razor blades that were inserted into a mechanical holder or similar. Even such blades were sharpened before. How many does this today I may wonder? 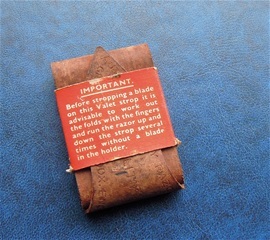 The even older razor blades were stropped frequently on leather strops that were robust leather. There are 3 things that people must remember and one is that this was attached to a wall while you hold it firmly and the other hand was used to run the razor blade up and down. It is unavoidable that there will be a curve in the leather. Second is the flexibility in the leather and the thickness. Third is the angle you hold the razor in while you are stropping. Another factor is the steel that was used and pressure applied. If you add up all these factors above you automatically see that SAKs traditional blades cannot be stropped in a similar fashion. However if you glue it on a hard surface and use leather that is thin you do not have to worry about anything else that pressure and correct motion. It is absolutely possible to use compounds as well. The old school stropping looks simple and it is because of their practice. Hollow ground blades was very common on such blades…. Hollow-ground straight razor blades can be stropped in the traditional fashion with good results. Remember that stropping is mainly maintenance. 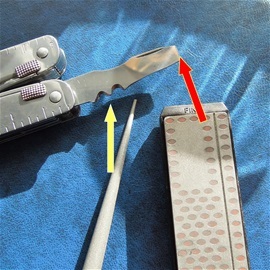 There are several steps for maintenance and sharpening. In other words stones must be used at one point. It is the same with sharpening-steels on fixed blade knives. Stropping and sharpening-steels are the minimum steps for maintaining the edge for some time. Stropping and sharpening-steel can be used during the sharpening process with diamond or natural stones to remove burr. 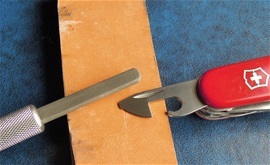 Stropping can be the last step as well after sharpening and to be used for maintaining knives. It is fully possible to use sharpening-steels with a fine surface on traditional SAKs. I hope you have enjoyed following me today. Last today I will mention that sharpening SAKs is best with only using diamond coated stones with different size configurations. 600-1000 grit stones can be used on practically everything with SAKs. It is a match made in heaven…So my advice is to use this for everything and it is very valuable to have diamond rods for waves and serrations. If you follow my pages on sharpening then this will be all needed to use. You do not have to strop or use any other devices to keep your blades very sharp all the time with a minimum effort that also saves time. I can write some more about diamond coated sharpening stones because I can see on the internet that there are some questions about them. There are differences between expensive high quality stones and less expensive ones. I have used both expensive ones and low cost types. The diamond dust and particles are bonded to a surface and depending on materials and quality this surface will either get worn or smoother in time. I have used some stones on much bigger tasks than just sharpening SAKs blades and I noticed that in time they get smoother. Sometimes it is not much difference between quality products compared to less expensive ones. It seems that the dust particles will wear off easier on the low cost ones but not always. It seems that sometimes it seems that the particles are completely gone. When using a pocket microscope I can see that there is some left but they are finer and this may be because the “diamond” dust that is a material that should get hardness close to diamonds got variations in quality. Some stones use diamond particles while some use something close or another material. Sometimes it is just the bonding materials that are left. Worn diamond stones can be used for polishing the edge. I do believe that low cost stones will wear off, get smoother and have variations in the dust particles hardness and abrasive abilities. Then again everything depend on use and if you use low pressure and make sure to use them only on knives then they will last a long time. What I can say is that high quality diamond stones last longer and they will keep the surface grit for a longer time. I would also like to say that all diamond stones will get a bit smoother anyhow from use. The difference in grit on a 600 grit quality stone will become a bit finer but not very much while a 600 grit low cost one will get 600-900 grit. I can also say that depending on what knives you are sharpening you can on harder steel use a coarse diamond stone before using the fine stone. If you use a low cost fine surface as an abrasive for sharpening removing much metal then they will get worn. It is important to know that it is a moderate to light pressure that is the key on all sharpening. On the stones you can see that they have the holes or areas that are not covered with the particles. These are to catch the metal, burr and substances from the sharpening process. Some do not use these and it got nothing to do with the quality that these must be on such a stone. Some do not use them and also depending on the quality some of these cavities can cause a problem. This is also depending on pressure applied and it can microchip the delicate edges. The reason for this is usually always that people forget to clean them. When the stone will get worn these cavities will be very close to the same level as the dust surface particles. Sometimes the dust particles are on a certain depth so you will have years of sharpening before worn out. Some high quality stones last and last. It is important to clean and brush away substances on the diamond stones. Further i can say again that low cost diamond stones can last a very long time. I know some want to have a superior edge on their knives that are close to perfect. I have noticed that low cost stones that get worn usually becomes even under the area you use. Diamond stones got an advantage that they will not curve like natural stones does it time. If the diamond stone is very low quality then it is used different materials and these will get worn uneven causing problems when you are sharpening. To get the superior fine edge then the surface you are using the knife on must be even. For normal sharpening it is no problem. Diamond stones normally use synthetic diamonds and this is a very good material. It is more than enough for sharpening normal knives to use synthetic and other hard abrasives. The crystalline form of the particles may be different. 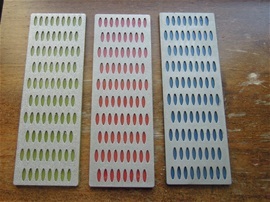 On the picture to the right you can see a set of three diamond coated sharpening stones. These are inexpensive ones that do the sharpening tasks well. From what I know about these from before they are fair quality for a low cost. These ones are new and because these are simply glued to a plastic holder then they are too lightweight to be used as a table-stone. I recommend gluing them on a wooden base with some weight so when you use them they will remain still during the process. It is possible to attach them in a vice if you can do it so nothing is over the height of the stones. From experience it is useful to have some extra height so maybe gluing a wood part in the same size and then this on a wooden-base. By doing so you have some working space for the hands and it is heavy enough to remain still. Or better able to be attached in a vice. On the internet you can see there are special purpose holders for stones and sharpening. I always prefer holding the knife in the left hand and using my main hand for all the movements and motion. If you do a Scandi-grind knife then table-stones are very useful and they will make it possible to keep the edge flat “Scandinavian edge” for a longer time. It is very effective. On SAKs it is very different because of many factors. It can be effective for larger SAKs to use a table-stone with a fine surface. It all depends on practice and training. When you sharpen a flat Scandinavian edge it is an advantage with some size on the stones. This is because you can by a certain motion sharpen large parts of the edge at the same time. Some does all the edge on one side in the motion. This edge also put more steel on the surface of the stones simply because the edge design is so. There is always a fine line with pressure when you sharpen. A scandi-edge require some more pressure applied and this is to make sure the edge is flat on the surface of the stones to keep that angle with not secondary edge. There is much more steel compared to many other types. If these knives have not been maintained properly the edge will become more convex . In some cases they get a full secondary edge that is weak compared to the original design. This is because they are sharpened wrong. Many times it is because people use small stones and wrong motion.The pressure you apply if you fully re-do it then you use less and less pressure. The last steps only require a fine surface with light pressure. The key to all sharpening is to know what pressure to use and with what. These are three different grits with what looks to be coarse, medium and fine. These are best for larger knives. 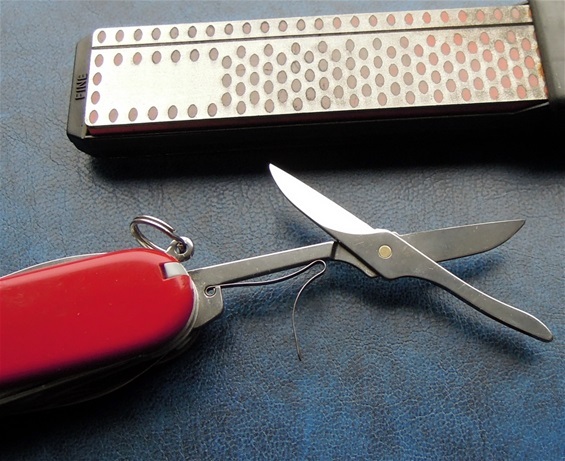 On Swiss Army Knives it is no need for using anything under 600 grit. Remember that even a new high quality diamond coated stone can feel coarse and that the best performance on the extra high quality ones comes after some use. I have mentioned a few places that a scandi-edge knife in my opinion must be flat. Some would say that a convex design can also be called so. A scandi-edge with a flat configuration is in my opinion one of the best edges ever made. These are very good for fixed blade knives that are traditional or full tang designs. It can be ok to mention a few edges and designs because from experience all knowledge comes to use in time. The absolute best and most effective way to sharpen them is to use extra-large stones on a table. If you use electric wheels then it can be effective with a holder that makes sure the angle is correct. Experienced people will have no problem using sharpening wheels free-hand. These should have water and the direction of the wheel and the direction you put the edge is important to prevent jumping. Once again the absolute key is the pressure you apply!